Heritage Auction is going to offer a unique early electrum coin on 17th August during ANA World’s Fair of Money. Electrum Staters are some of the earliest coins to be struck on earth which are generally found in crude shapes and designs. However, the offered coin is rare since it features a bearded man’s portrait. Electrum is composed of different quantities of silver and gold and is naturally found. It was used to produce coins for the first time in Lydia. The same compound was used by neighbouring regions like Ionian Greeks to make coins in the following years. 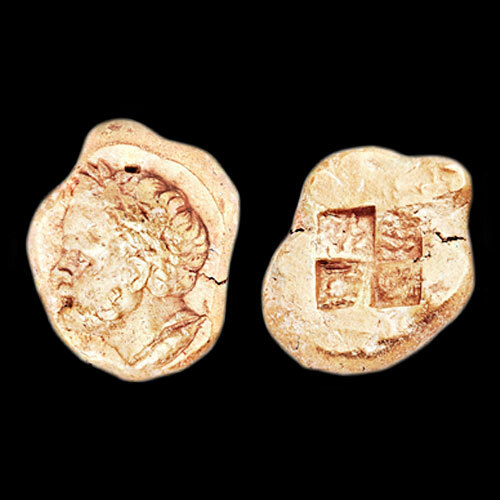 The offered coin was struck in Cyzicus in Mysia in early-middle 4th century B.C. The obverse features a bearded male with a laurel crown and a small fish below him. The reverse features a typical four-part incuse pattern. The 16.1 grams stater has a width of 21 mm and was the largest denomination in the monetary system. Experts believe that the portrait is of an Athenian General named Timotheos, who led the siege of Cyzicus in 363 B.C. and died in 354 B.C. It resembles a marble portrait which is showcased at the Capitoline Museum. There are many theories and assumptions regarding this subject, that researchers are still trying to decipher. The Persians ruled Cyzicus from 540 B.C. to 445 B.C., and then from 387 B.C. till the Achaemenid Empire collapsed. Cyzicus and Athens were members of the Delian League during this time period. League members were generally not allowed to strike their own electrum staters. But Cyzicus was allowed to strike their own coins as they were accepted internationally and Athens was reaping its benefits. When General Timotheos led the Persian siege of Cyzicus in 363 B.C, coins featuring his portrait were issued to honour him like the way Athenians honour their leaders. The coin is graded AU 5/5 - 3/5, Fine Style, flan flaw by NGC. It was struck with an obverse die that had a very high relief realistic portrait. It has a pre-sale estimate of $45,000 to $60,000.